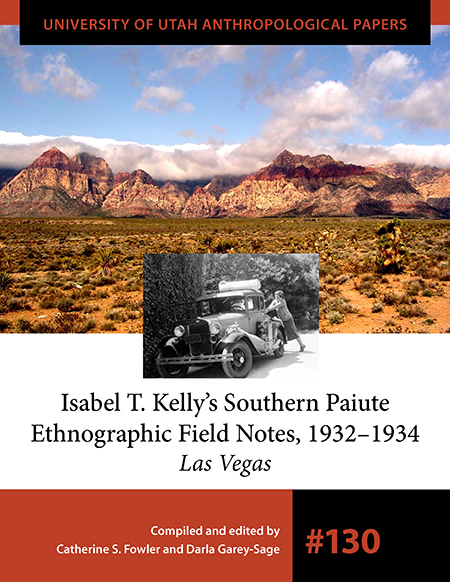 This publication presents the first volume (Las Vegas) of the early ethnographic field work of anthropologist Isabel T. Kelly. From 1932 to 1934, Kelly interviewed thirty Southern Paiute people from southeastern California, southern Nevada, and southern Utah about “the old ways.” During this time, she filled thirty-one notebooks, made several maps, took roughly fifty photographs, collected nearly 300 ethnobotanical specimens, purchased and shipped over 400 ethnographic artifacts to museums, and traveled more than 7,000 miles. Her notes comprise the most extensive primary ethnographic documentation of Southern Paiute/Chemehuevi lifeways of the middle to late nineteenth and early twentieth centuries existing today. Although Kelly intended to publish these notes, she was unable to before her death. Fowler and Garey-Sage have now synthesized the first set of these handwritten field notes and sketches, providing commentary and illustrations to put them in context for the modern reader. Kelly’s data, most of which could not be gathered anew today, are offered here for the use of generations to come. Catherine S. Fowler is professor of anthropology emerita at the University of Nevada, Reno. Darla Garey-Sage is deputy director of the Nevada Rock Art Foundation.